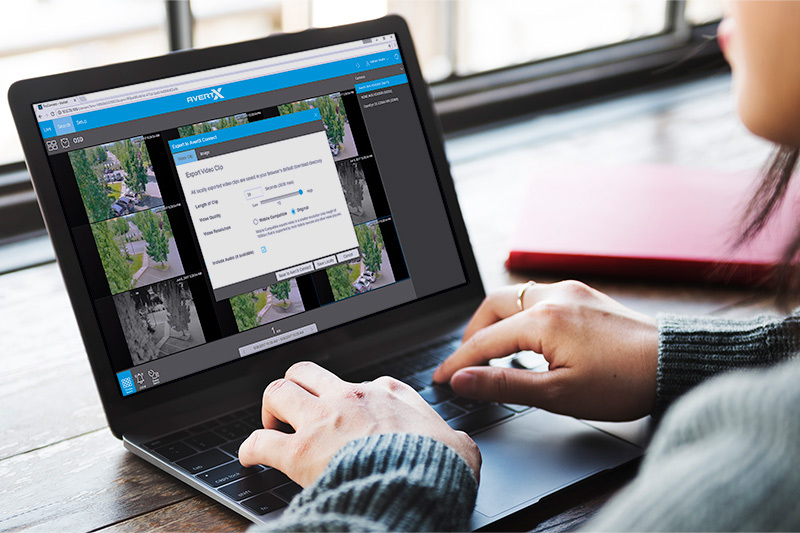 Experience the Professional difference with the AvertX ProConnect Video Security Platform. Take advantage of exciting new features like video export to the cloud and a dedicated Apple TV app to access and share video like never before. AvertX is constantly developing our ProConnect software, so you can enjoy new features and improvements for years to come. AvertX products are supported by our US‐based PRO Team and backed by a standard two‐year warranty. Free support for the life of your system! Need help? Call the Pro Team! Integrated PoE switch, eliminating the need for an external switch. The most important part of your video security system investment is the software that powers it. AvertX is constantly developing the ProConnect platform, so you will benefit from new features, improved performance, and cybersecurity updates for years to come and without a hidden subscription fee. When a new update is released you are notified and can apply the update with a single click of a button. Improvements to our Professional Grade software now let you record up to 24 channels using an external switch* without any additional licensing fees. 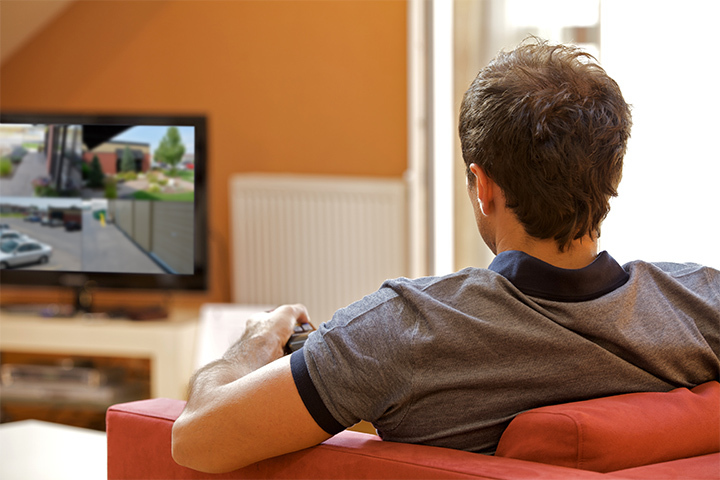 Is your video system cyber-secure or is it creating a vulnerability at your home or business? Recently, many IP cameras and video recorders have been linked to widespread cyber-attacks. All AvertX software has been developed with cyber security as a priority. ProConnect recorders automatically establish a trusted outbound connection with the AvertX Cloud for a hassle-free and secure networking experience. All metadata transmitted over the Internet is secured using military-grade encryption. Read more about AvertX Cyber Security. 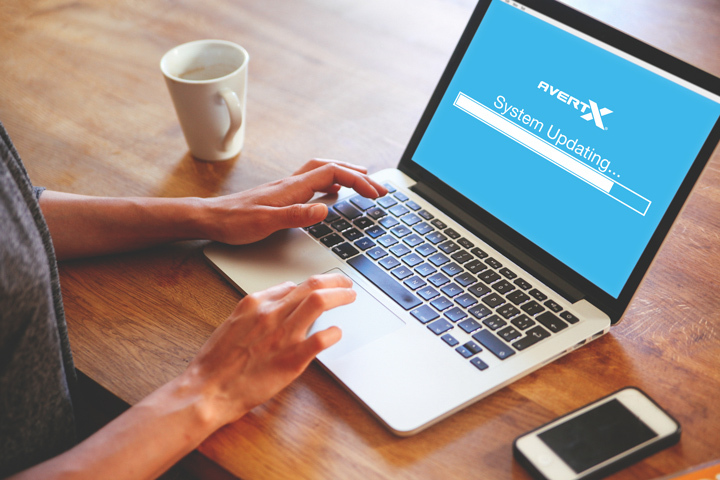 The AvertX Cloud enables powerful new tools and features with a user experience as easy as watching a movie online! Set up user accounts for family, employees, or law enforcement and instantly grant and revoke access—all the way down to the individual camera! Free access for the life of your system! You don’t need to watch your cameras all day, the AvertX Cloud will let you know when something is wrong! 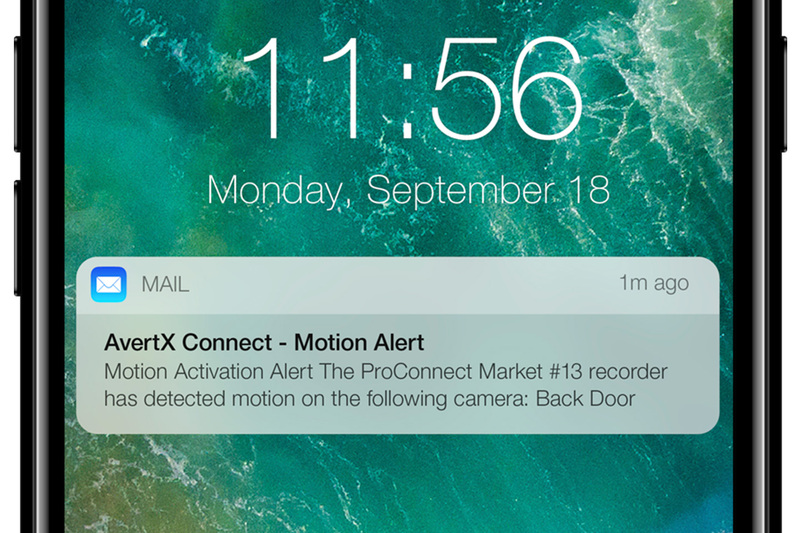 Receive an email alert when cameras detect motion, when sensors are activated, when cameras are offline, or when your recorder is disconnected. Our powerful Alert Macro interface lets you set the time and days you want in a 24-hour window to receive alerts, set multiple triggers for alerts and multiple actions to take when an alert is triggered! Often the most frustrating part of owning a surveillance system is finding the video you need. 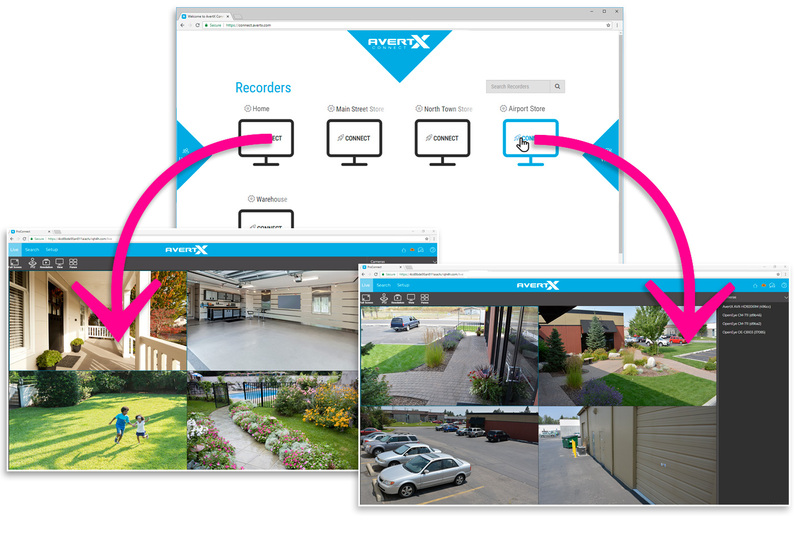 AvertX ProConnect features multiple options for quickly and easily finding video clips, including Event Search, Time Bar Search, and our exclusive Preview Search. Using Preview Search, you can find events with a visual difference before and after the event, like theft or vandalism, in a matter of seconds. Once you’ve found the video clip you need, all it takes is a few clicks to export to your AvertX Connect for secure storage or easy sharing via email. No more searching for a thumb drive for exports! Most of today's video surveillance devices run complicated software designed and developed by overseas Original Equipment Manufacturers. The result is an overly complicated and frustrating user experience. AvertX ProConnect software is developed in the USA for hassle free operation and the ultimate user experience. If your priorities are reliability, cyber security, and ease of use please call the AvertX Pro team for a live product demonstration. The AvertX ProConnect Apple TV app allows you to display live video from your ProConnect recorder from the comfort of your living room or anywhere you have an Apple TV. Securely install your recorder anywhere in your home or business and easily view live video on any TV without the hassle or complexity of running an HDMI® cable from your recorder. Business expanding? So can your system! Don’t buy a new system because you need a couple of additional cameras. 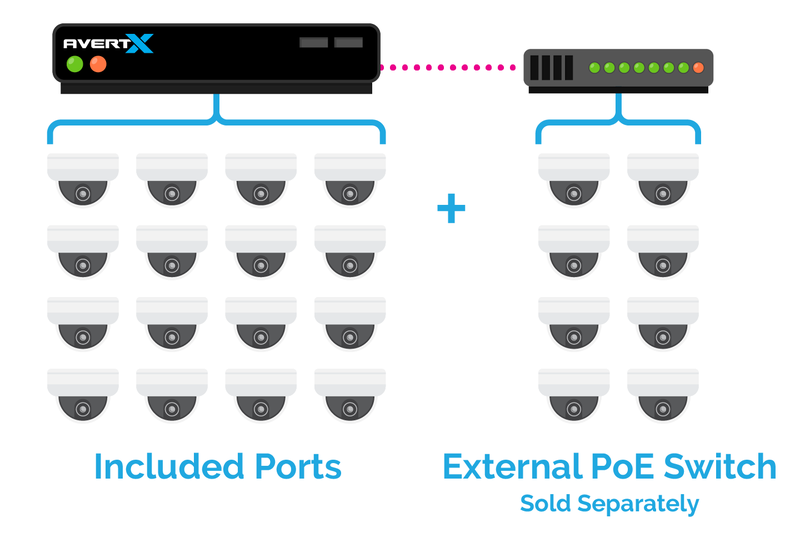 Every new AvertX recorder can record up to 24 cameras with a separate Power Over Ethernet (PoE) switch. * Just plug a PoE switch into the External Switch Port on the back of the recorder to add additional cameras! You can even simplify installation by placing a separate PoE switch and multiple cameras in an outbuilding or other remote location and run a single Ethernet cable back to your recorder. AvertX offers everything you need for a clean, professional looking installation. All of our recorders have an extra gigabit ethernet port for an external PoE switch and can tie in to existing network infrastructure for faster installation. They even include rack ears and are server room-ready! 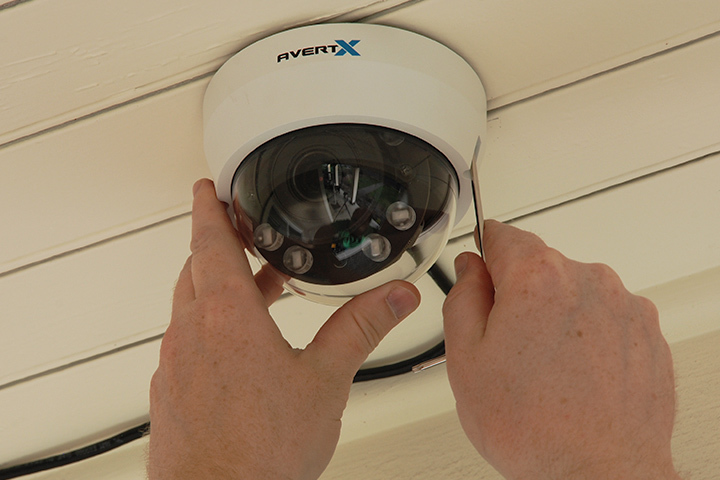 AvertX offers an extensive selection of camera mounting accessories for a clean and secure installation in any location. Got a large project? Don't forget about AvertX for bulk sales! Contact AvertX Support to discuss your needs. AvertX has designed its system with integral features to simplify installation. An integrated PoE switch means you only need to run single cable your cameras. At startup, the ProConnect NVR recognizes your cameras and starts recording. The key to a successful installation is planning. Please visit our DIY Corner for resources to choose the appropriate system for your home or business and tips and tricks for installing and getting the most out of your system. If you have any questions about your installation, call the AvertX PRO Team! We have a professional to help you with every step of the process. Want to understand the AvertX Cloud difference? Call our PRO Team. Need help designing a system and selecting the right cameras? Call our PRO Team. Need help with setup? Call our PRO Team. Selecting and installing a system can be intimidating. Our PRO Team is here to help for the life of your system! Call us at 855-228-3789 with any questions or for a live product demo!